Trans-form, Trans-it, trans-port.org, a conceptual FL@33 project based on everyday observations of tower cranes, self-published, award-winning magazine with attached CD-Rom and a website. Trans-form, Trans-it, trans-port.org is a self-initiated Architecture, Art and Design publication by FL@33 founders Agathe Jacquillat and Tomi Vollauschek. 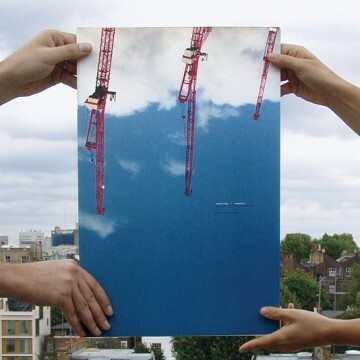 It's a conceptual project based on everyday observations of tower cranes combining a magazine, a CD-Rom and a website. 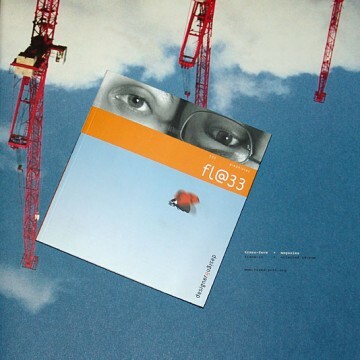 The project was made public in July 2001 during the Royal College of Art, master degree Show in London and marked the birth and intentions of FL@33. The large scale magazine explores the magic of urban sculptures that appear and disappear in the cities we are living in. Tower cranes that are lifting, transporting, re-constructing, drawing, cutting, performing and trans-forming are usually unnoticed by the public's eye. Trans-form presents information about tower cranes and crane operators' daily work in the sky. The CD-Rom adds videos and animations combining industrial structures with natural imagery and is presenting a cityscape metamorphosis, defining our cities as being in a larval stage. Trans-port.org offers you the possibility to build your own crane, to climb a tower crane and to be a crane operator. The widely-acclaimed project has been mentioned and featured online and in numerous magazines and books around the world. Stockists / Currently available again: Trans-form used to be available in bookshops and museum stores around the world. It was believed to be sold out for years but a box full of Trans-form magazines in mint condition (including Trans-it of course) has recently been unearthed and the previously sold out magazine is currently available again – exclusively at stereohype.com (worldwide shipping). Please note that a screen capture preview video of the CD-Rom's content was recently posted at flat33.com. FL@33 also created an updated 'player' for Mac OS X users to enjoy the CD-Rom's content that was originally created for Mac OS 9 at the time. A link to this free app update can be found in flat33.com's Downloads section.